Award winners at the 2015 event. Composites UK, the trade association for the UK composites supply chain, has launched the entry process for its 2016 composites industry awards. Back for its fifth year coinciding with the Advanced Engineering Show at Birmingham’s NEC, the Composites UK Industry Awards Dinner will be held on 2nd November at the National Conference Centre, Birmingham, UK. The 2015 event saw a 55% increase in attendee numbers with over 150 seats already sold for this year’s event. The award categories cover innovations in composite design, materials and manufacture, environmental/sustainability advancements and health and safety system installation as well as personnel accolades – employee, employer and trainee/apprentice of the year awards. ‘We launched the awards so that the UK industry could celebrate its achievements as a world-leading innovator in composites and are very happy to see more and more companies nominating themselves for awards, including many SMEs,’ said Andrew Dugmore, chairman of Composites UK. 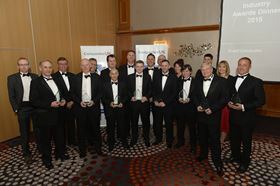 Previous award winners include Airbus Operations, Aircelle, EcoTechnilin, ELG Carbon Fibre, Far-UK, Hexion CCT, Metrology Software Products, MPM Limited, Morgan Composites and Defence, Techlan and Zircotec. Entry forms are available to download from here. The awards are free to enter but to be eligible, companies must have a base in the UK and have positively impacted the UK industry. Shortlisted companies will be expected to attend the dinner. The deadline for entries is Friday 27 May 2016. This story uses material from Composites UK, with editorial changes made by Materials Today. The views expressed in this article do not necessarily represent those of Elsevier. Euroresins UK has launched a new online store for UK artisan and consumer composites markets, according to Composites UK.